Chief Executive Carrie Lam has said she expects a tough fight in the process of passing the joint checkpoint arrangement for the Express Rail Link. But she said she believes the proposal is in accordance with the “One Country, Two Systems” principle and the Basic Law. The controversial arrangement for the Guangzhou-Shenzhen-Hong Kong Express Rail Link has been under discussion since almost ten years ago, and has often been questioned for potentially violating Article 18 of the Basic Law. It stipulates that national laws shall not be applied in Hong Kong, except for a few stated in Annex III relating to certain circumstances involving national issues. Democrats have often questioned the feasibility of implementing a mainland immigration, customs and quarantine zone on Hong Kong soil without violating laws. The proposal will likely require discussion and a vote at the Legislative Council. The government has repeatedly insisted that the HK$84.4 billion rail link must adopt a joint checkpoint or co-location arrangement, or its effectiveness will be diminished as passengers would have to disembark in Shenzhen for border checks. The line is expected to be operational in the third quarter of next year. Lam said the Secretary for Justice and relevant secretaries will explain the arrangement shortly. 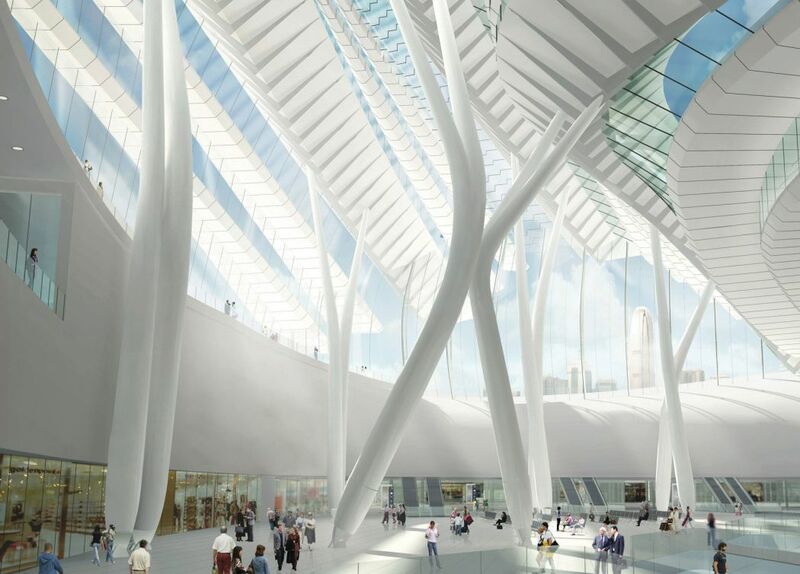 Photomontage of Express Rail Link West Kowloon Terminus. Photo: Andrew Bromberg at Aedas/Wikimedia Commons. 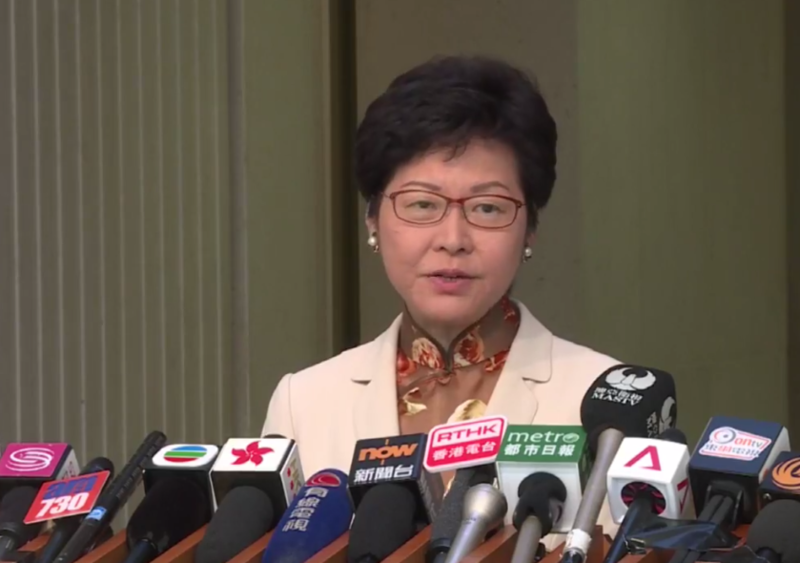 Lam said it was inevitable that the arrangement would be described as “the first political hot potato” of her term. “This is a complicated issue – I don’t expect that the process will be smooth the whole way through, but our colleagues at the government will try very hard to explain it to the public,” she said. Even though it has not been officially announced, details of the arrangement were leaked to the media by anonymous government officials. Under the arrangement, the government will reportedly lease part of the West Kowloon Terminus to the mainland. According to reports, armed mainland officers will be stationed at the Terminus and mainland laws will be applicable after passengers pass Hong Kong immigration. 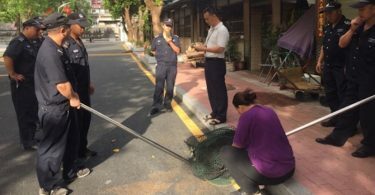 The joint checkpoint arrangement would be a reversal of the Shenzhen Bay control point, where Shenzhen leased a piece of land to Hong Kong for law enforcement. The train cabin will also reportedly be a mainland area and there will not be Hong Kong law enforcement agents on the train, meaning that criminal cases occurring on the train may be handled by mainland authorities. 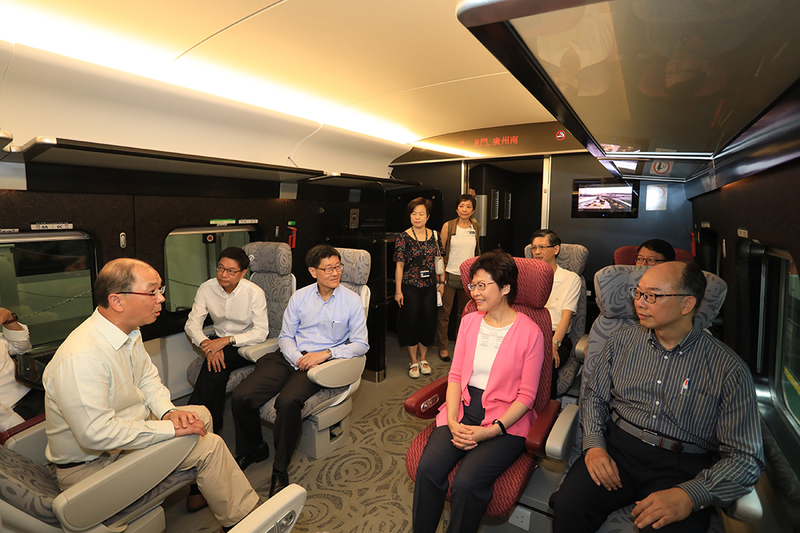 Carrie Lam inspecting Guangzhou-Shenzhen-Hong Kong Express Rail Link trains. Photo: GovHK. 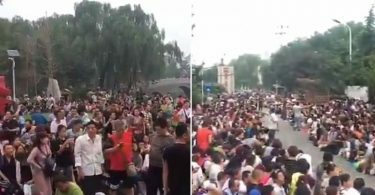 She said that, even though the Legislative Council is on a summer break, the government will arrange meetings to explain the plan should lawmakers wish. “I hope our efforts will be seen in the future as having recovered the public’s trust in the government,” she said. Lam said the aim of the project is to connect Hong Kong with the “vast rail network” of the mainland. The express rail link is not just a faster version of the existing Guangzhou–Kowloon Through Train, which has to to stop at Guangzhou, she said. The Executive Council will take a summer break for two weeks after Tuesday.